This Thursday's meeting was in sharp contrast to the meeting on September 27 when the public was directed to watch the meeting from another room through closed circuit TV. 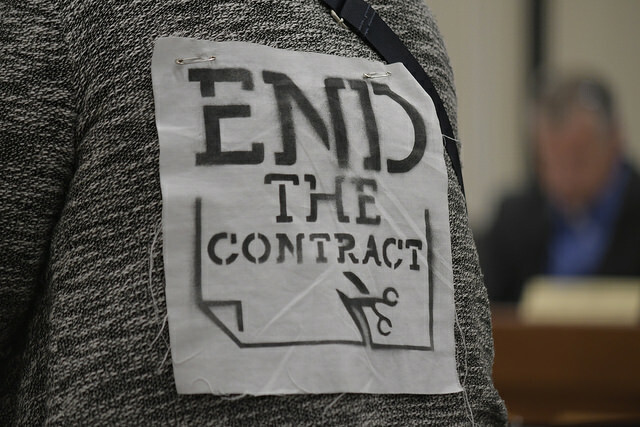 Public comment continued to center on Kent County's contract with ICE. 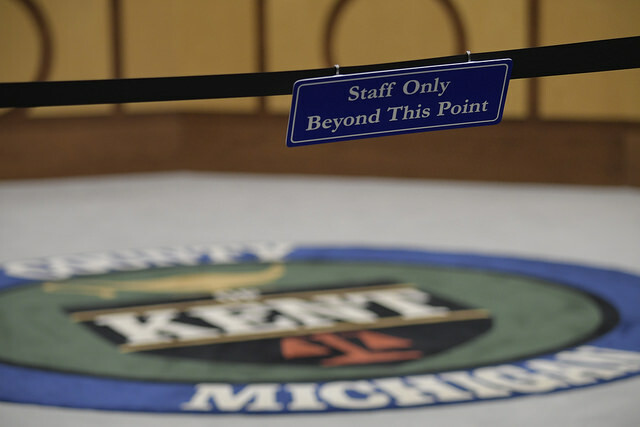 The public was allowed into the Kent County chambers again on Thursday, October 12, 2018 for the monthly Board of Commission meeting. It was the quarterly evening meeting held at 6 p.m., instead of the usual 8:30 a.m.
Board Chair, Commissioner Jim Saalfeld of District 11 was notably absent from the meeting. The last county board meeting on September 27, 2018 when the public was kept from the chambers and directed to watch the meeting from another room through closed circuit TV was at the direction of Saalfeld and county staff. Vice Chair, Commissioner Mandy Bolter of District 5 presided over the meeting. Bolter opened the meeting saying, "We welcome everyone. We want everyone to feel welcome here at our commission meetings," to which several in the public laughed. She received the verbal two minute warning commenters are given during their three minute time period and supporters in the crowd urged the commission to let her finish speaking since her time was shortened due to translating. She was allowed to finish her remarks. 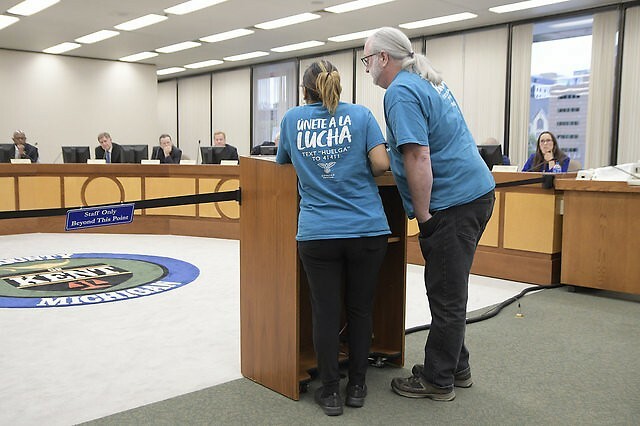 At the end of the public comment time, members of Movimiento Cosecha GR and GR Rapid Response to ICE chanted “End the Contract” as Bolter moved the meeting forward with its agenda. At the end of the meeting during “Miscellaneous” time when the commissioners can speak to whatever they wish, a few commissioners noted they were pleased to have the meetings 'back to normal' and relieved to be having the public in the room again. These included Commissioners Phil Skaggs, Betsy Melton, Carol Hennessey and Dan Koorndyke. Commissioners David Bulkowski, Betsy Melton, and Carol Hennessey all called for the implementation for a task force to look at what the county could do about the concerns around undocumented immigrants and ICE. Commissioner Robert Womack said he didn’t want a task force, but that “the time has come to write up a resolution recommending to the Sheriff’s Department to end the ICE contract and have it voted upon so we can go on record to see what each commissioner thinks.” He noted that even with “disruptions” in past meetings, the commissioners had had many chances to hear “a lot of heartfelt testimony” from the community. 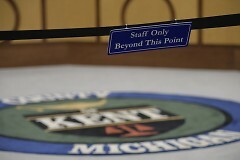 The meeting can be viewed here on the Kent County’s Youtube channel.